Tamesis Dock is a loveable original 1933 Dutch Barge that churned the waters of the Seine for years and is now permanently moored between Vauxhall and Lambeth Bridge. The vessel holds up to 200 people and offers generous indoor and outdoor spaces with views across Parliament, the London Eye and the river. It also plays host to music and comedy events. What did you think of Tamesis Dock? Amazingly Quirky Venue on the Thames. Love it throughout the year, Lower Deck in Winter, Upper Deck in Summer. Great Atmosphere and music. LOVE LOVE LOVE! I spoke with the staff and was pleased that they were happy to rectify the issues by compensating us for the inconvenience. Could have been avoided if the communication was better. On the positive side it is a great venue, and the food service was good! Very disappointed with the service, unprofessional and lacked knowledge of how to deal with simple tasks. Russian Lady in particular was very unhelpful, and unprofessional. So we have lived in the area for a few years now and have wanted to go to Tamesis Dock...Finally today we were in the area and at the same time were ready for some food! It was a beautiful day and was lovely to be sitting on the deck with the nice breeze. We have a young daughter and I asked if they had a high chair, the girls behind the bar were a bit sheepish and not that pleasant to speak with and just said no. We ordered our food, fish and chips and thia curry. When the food arrived it was clear straight away that the fish (battered) was frozen (from a box). It had that perfectly shaped look and to add insult to injury was over cooked! The peas were cold, and there was half a handful of chips... not at all worth the money! Then on to the thai curry, it was lukewarm and you could tell the veggies were frozen veg and it was not cooked on the spot there and then, even the rice did not taste freshly cooked! We could not understand how this quality of food was coming out of the kitchen! We know for the price we were not expecting a la carte, but this was beyond a joke! I then went down stairs and asked the girl behind the bar for the manager she said she was not in until after 3pm and that was that. I then said well I would like the phone number and continued to tell the girl about our food complaints, she just said "oh sorry" and that was that! I was meant to host a hens night there and I am so glad that fell through, I have eaten at some interesting places before but this one takes the cake, even the man that brought the food out did not understand English much but did admit the fish was frozen from a packet.... review finished! I had my 'Life-changing' party on the Tamesis, and had one of the greatest time since I've been in London. The staff is friendly, the menu is basic but you can trust the homemade nachos to fill you up! And you get the fantastic view on Big Ben and the London Eye... A really cool and chilled venue that I'd recommend anytime! This is a great venue for relaxing and enjoying the view. We recently held an event on the boat and spent over £300 on a buffet. What came out was burnt, not as ordered and was nothing like enough to feed the numbers we booked for. The quality of the food was very poor also. If you are considering holding an event here, please be aware of what happened to us. It ruined an otherwise great day. A great little bar.....went and had a couple of beers on the saturday before the marathon...good music, relaxed, friendly atmosphere. I was really amused to read the review below. The boat really isn't the type of place to offer you a pre-dinner drink or direct you to the bar (particularly as it's the first thing you run in to when you enter!). It sounds like the group expected somewhere different- the boat is relaxed, un-perfect, on a tilt, friendly and full of charm. The only thing I've eaten was the organic bacon cheeseburger which was tasty and great value. I can imagine this place will be great in the summer but I thought it was fantastic in the winter too. Good location, and might be fine for a drink in summer or to listen to the live music advertised. Went with a reasonably sized work group (15) for the Christmas menu. I arrived early and was not directed to the bar for a pre-dinner drink - just as well, there didn't appear to be anyone available for service anyway. Disappointed with the quality of the food, the service and the venue. Much of the food was deep-fried, and my food came out cool. Would have been very cold by the time everyone at the table had received their meals. Good thing I chucked my table manners overboard and just tucked in without waiting. The manager didn't seem to see any issues with this when we discussed these concerns after dinner. The soup for a starter was probably the better choice. The roast turkey was reasonable, although the vegetarian option did not please those who chose it. The salmon was apparently full of bones, in some pieces, and appeared deep fried. The dessert was reasonably presented and probably the best course of the three. The service was quite slow. Apparently one wait staff was coughing all over the place. Glad I didn't see that, as it would have put me right off. We were very cold, with many people keeping their jackets on, or putting them back on during the course of the meal. This was in spite of the two heaters pointing at us and turned on full. Nice house red wine. We raised our concerns with the manager, who said the feedback was appreciated, but that no one else has seen fit to complain. I have had far better meals for less than this cost - 25 - 30 quid plus drinks. Would not recommend for dinner. Unlikely to go again in future with so many other good options available elsewhere. Have been to Tamesis Dock many times and am never disappointed! 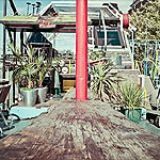 This cozy, friendly barge has an amazing view of Westminster and the London eye, and has a fun and funky interior. During the hot summer days you cannot find a better establishment to sit outside and have a drink- and the calmer winter days are perfect for a cozy meet up with friends. 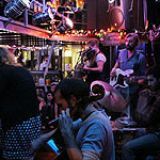 They have lots of great live music evenings and fancy dress parties that are very reasonably priced or free- I joined their group on facebook and am reminded every once in awhile of their upcoming events. They have recently changed their menu to have more of an Italian influence rather than pub food- both the tuna main and the aubergine starter were delicious. They home-make everything they serve- pasta, ciabatta bread, etc. Yum! Definitely check them out for something different (better) than the norm! I was staying in the hotel opposite with my mum after a girly theatre night. We love the hotel and it's bar but knew the prices to be a bit steep and we were saving up for the delish apple pie on room service. We decided to cross the road to the opposition and I have to say had a great night. Large glasses of vino, well priced as compared with Enfield- North London, great vibe( everyone just nicely relaxed, no swearing or puking considering the hour or maybe that's just Enfield) and an interesting choice of tunes. I will be back with girl friends and highly recommend this laid back gem. ..top heavy beer glasses....methinks management ( a bit snotty as he is ) wants customers who have booked the boat for a party to buy more and more beer ( of course ). The food which I ordered was incredibly salty. I am in fact generally laid back about all this sort of stuff,but I have to say personally I felt very unwelcome on Tamesis Dock and will not be returning. a great atmosphere for relaxing on deck with friends or getting your groove on to the funky music downstairs. Thamesis is a classy venue with a view to match. Highly recommended! This is a great find as i normally vist the boats near embankment I had a great time for the New Years Party excellent food,good prices for the drinks staff made us feel very warm and welcome very good athmosphere just a note the DJ could have played more music. Thanks to Nina and her team great party see you in the summer and new years eve 2009 ! This bar is such a great find. I'm almost hesitant to write a review because I want to keep it a secret and avoid over-crowding! I put on a party here in the summer and the staff were so great. Everyone was extremely helpful and fun, allowing us much freedom to create our own bespoke event. You can plug your own Ipod in to the music system, arrange your own catering (though they can also supply this for you, if you prefer), move the furniture and decorate the place to suit your own party theme...and you can cheaply hire the lower deck to make this an exclusive event (though that's not to say you can't join others at the bar or drink on the deck - which boasts cracking views of the Parliament buildings. For casual drinking it's also a great success - a nice selection of beers, an easy-going environment, and some great live music. Let's just hope it doesn't go 'corporate' and cash in on its popularity. All aboard this peculiar floating pub, which makes a great party spot, should you have the sealegs for it. Summer days were made for pubs like Tamesis Dock, where you can sit on the top deck and soak up the rays on the River Thames, without ever setting sail. This boat pub has moored at Albert Embankment, just a short walk from Vauxhall station and overlooking the Houses of Parliament at the other side of the river. 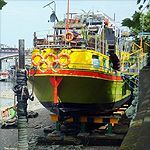 The original Dutch barge sets itself apart from the dreary road and murky Thames waters with its bold yellow, red and green paintjob, reminiscent of a Rastafarian flag. Scale the boat from a permanent wooden ramp and you can choose to venture to the top deck, which is spread across several tiers and split into two sides, with plenty of picnic bench seating. Or there’s the lower deck, where you’ll find the bar. The main source of light in here is from a few cute portholes as well as fairy lights when darkness falls, and it’s colourful and cluttered in this cosy boat thanks to a mishmash of art on the walls. A disco ball is suspended above and the deck splits down to a further basement level, which can be hired out and is also used for gigs. If you’re a bit sensitive to seasickness, you may find yourself feeling queasy on Tamesis Dock - even though it’s moored to dry land – thanks to the choppy Thames waters. But on rare pleasant days, this floating pub is a real treat, overlooking the Houses of Parliament and with sun bouncing off riverside buildings and those rocking waters. On these occasions, you’re best advised to book some space on the top deck, as the pub is small and in demand from local office workers who are regular faces throughout the week. 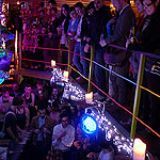 Indie gig nights are just as popular below deck, and this space is also in frequent use for private hire events. But it’s the top deck discos you’ll want to know about on occasional weekends, and the boat also acts as a host venue for Finnstock music festival. Honest pub grub is what’s in store on board Tamesis Dock – sharing platters, burgers and wraps. Don’t be expecting any catch of the day here, although you can order classic fish and chips (£8.95) or a fish finger wrap (£4.50), should the mood take you. Nachos (£7.50) are a hit, as are chips served with aioli (£2.95). A nice idea is a weekend brunch, so if the sun is shining particularly hard, locals can tuck into a Full English (£7.95) or eggs benedict (£5.95) while the boat laps up the waves. And even dessert is available – it looks like mostly run of the mill options until you reach the largely appealing sight of gin and tonic sorbet (£3.95) on the menu. Draught lagers are in good supply and aren’t from your bog standard big brewers either, suiting the pub’s independent vibe nicely. Bitburger, Coors Light and Camden Pale Ale range from £3.90 to £4.40 for a pint. Bottled beers continue this feel, with Blue Moon (£4.20) and Brooklyn Lager (£4.50) also available. Spirits come in double measures as standard for around £6.50, and include the obligatory Captain Morgan rum for classic seafaring. For a full-on boat party experience, a few classic cocktails are on offer including a Mojito, Caipirinha and, for a bit more class, a Cosmopolitan. 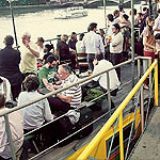 This would be a pleasant enough pub if it were just down to its sprightly independent ethos, fun music line-ups and party atmosphere, but the very fact it’s a pub on a moored Thames barge makes Tamesis Dock a character-filled spot with a difference best enjoyed in the summer.